I love chicken tenders. A little bit of ranch, a little bit of bbq, some fries (or mashed potatoes) and I'm in food heaven. Since having to go gluten-free though, it's rare to find them on a menu out at restaurants. So I've done a little experimenting of my own in the kitchen. They turned out particularly well last time, so I thought I'd share! Buying gluten-free breadcrumbs can get expensive quickly. And I don't know about you, but I don't bread enough to go through one of those packages. I had some Udi's bread that was going stale (#classy), so I baked a few pieces at 350 degrees until the bread was almost crisp. I then put the bread in a food processor with a little (gf) flour, garlic, paprika, and pepper. When the ingredients were well mixed, I made sure to fully cover each chicken tender with the mixture and put them in the oven (on a greased cookie sheet) to bake. 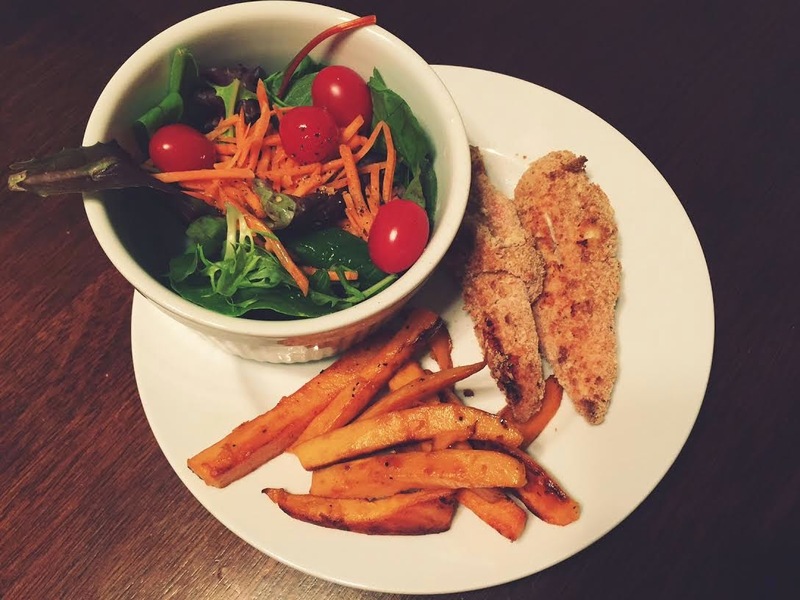 We made some sweet potato fries, threw together a salad and called the meal complete. This one is going in the recipe books. We always make our own breadcrumbs from stale bread - they are the best!!!! You know what's going in them, you can control how fine or coarse they are, and they just taste better. If you find that you have the ends of bread that don't get eaten, just pop them in a gallon zippy bag in the freezer until you have enough to make crumbs. Then let it all sit out on the counter on a cookie sheet until it's rock hard (if it's out in the air it should not go moldy) - then wizz it in the food processor, They will store on the shelf for several weeks) YUM!! !